Growing up, we always had a dog. Tonka was with us the longest (about 18 years), and she was incredibly smart. All of our dogs over the years came from adoption groups. My dad always said that these made the best dogs because they knew that they had been rescued. At Sunny Meadows, I saw many dogs and cats looking for their forever homes. While I was there, Beth Walker gave me a tour and introduced me to the animals. After spending just a few minutes with Beth, it’s obvious that she’s an animal lover. She’s taken many of the shelter’s pets home to foster them and even takes some of these to the dog park. In addition to working, Beth is also finishing her degree in Criminal Justice. When I asked her what she plans to do after school, I was impressed to find out that she wants to start her own division of animal cops in Memphis. She told me that she’s seen so many of these animals rescued from terrible conditions, and she wants to do more to protect the pets in our area. Go Beth! Volunteers at Sunny Meadows get to focus on playing with the animals and the staff takes care of everything else. “We just need people to love on the animals” Beth Walker told me. Sunny Meadows has no shortage of animals in need of attention: with more than 150 dogs and 30 cats, the lean staff spends so much of their time on maintenance that there’s little time left to play with them. That’s where the volunteers step in. While I was there, I played with several dogs. One of these, Dusty, was a big sweetheart. He was clearly happy to have company and was a good sport in front of the camera. He was rescued from the streets, and this once thin, shy dog is healthy, happy, and energetic. 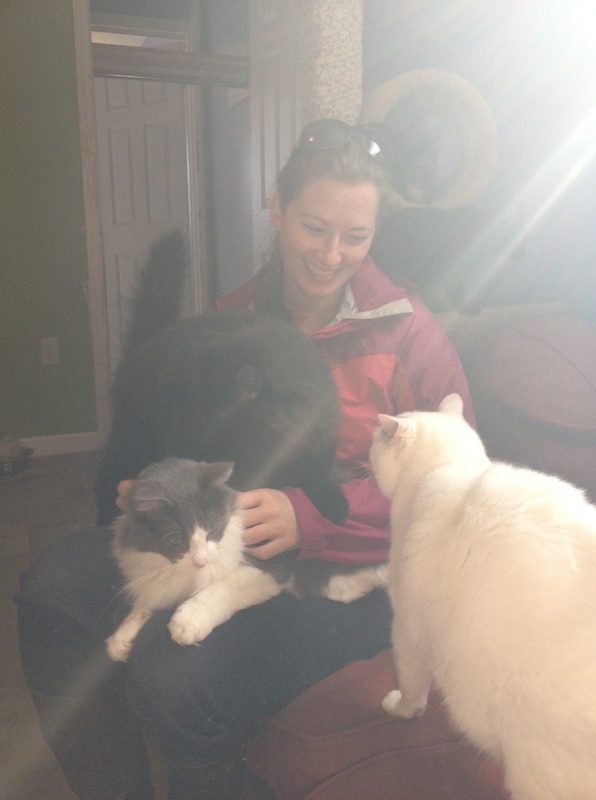 I also spent some time with the cats while I was there. These were a little harder for me to keep straight but it’s obvious that some of them are very friendly. I walked into the cat room with Beth and she told me that it was easy to spot the friendly ones – you just had to take a seat on the couch. If you’re an animal lover, you’ll find the perfect volunteer opportunity at Sunny Meadows. If you’re looking to add a furry addition to your family, you’ll find that here too! Volunteer! Sunny Meadows is always looking for animal lovers to spend some quality time with the pets. Adopt! There are lots of animals who would be happy to join your family! You can also contact Katey at volunteers@sunnymeadows.org for more information! Wait, they need volunteers to PLAY WITH THE ANIMALS?! That sounds ahh-mazing. Proud of you for taking on such an ambitious challenge of 30 days of volunteering. Pretty awesome indeed. Keep up the good work!